This Southern Pork Chop Dinner is an entire meal that cooks in one pot! Heat olive oil in a deep 2-quart skillet or Dutch oven over medium-high heat. Season pork chops with salt and pepper on both sides and place in the skillet. Brown pork on both sides (about 5-7 minutes per side). You want nice color on the chops for flavor, but you do not need to cook them all of the way through (they will continue cooking in the pot later). Remove pork from the skillet and set aside on a plate. Reduce heat to low. Arrange potatoes in the bottom of the skillet and place remaining vegetables on top. Season vegetables with salt and pepper, to taste. Add browned pork chops on top. Whisk together soup, water, and hot sauce. Pour over the pork and vegetables. 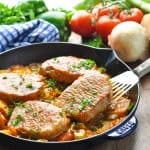 Cover and simmer over low heat for about 40-45 minutes, or until vegetables are tender and pork reaches an internal temperature of 145 degrees F.
I recommend thick-cut boneless pork chops, which have a longer cooking time than their smaller counterparts. This allows the vegetables to cook through without drying out the meat. Use a large enough skillet or Dutch oven to accommodate your pork chops comfortably. You don't want to crowd them in the pan, which will make it harder for them to brown (they'll just "steam" instead). After browning the pork chops, do NOT wipe out the pan. Leave the oil and the browned bits in the bottom of the skillet. This will help the potatoes become crispy and it will prevent them from sticking to the dish. Use a meat thermometer to know when you pork is cooked through. It needs to reach an internal temperature of 145 degrees F, so check it as it cooks! To cook pork chops in the slow cooker: brown the chops in a skillet, as instructed. Then place the vegetables at the bottom of a slow cooker, place pork on top, and pour sauce over all. Cover and cook on low for 4-6 hours or on high for 2-3 hours. Check the meat early, though -- every slow cooker runs at a slightly different temperature, and you don't want to overcook the meat and dry it out. To cook pork chops in the oven: brown the pork chops in a skillet as instructed above, and then cook the entire meal covered in the oven at 325 degrees F for about 40-45 minutes.